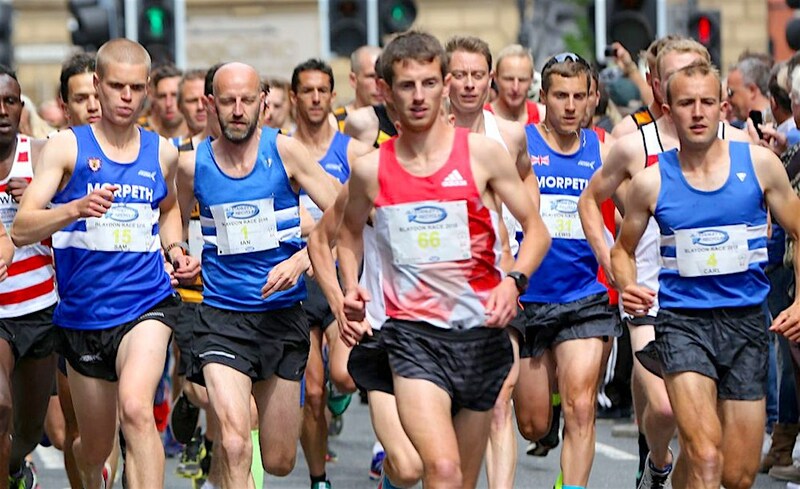 The legendary Blaydon race in the North East of England celebrated its 37th anniversary this weekend, and the athletes didn’t let the party down with some quality times reflecting the high regard this 5.6m race is held in by the athletics community. Newham & Essex Beagles’ John Beattie showed his class when he beat off fierce challenges for the title from Morpeth’s Carl Avery and Gateshead’s Chris Parr, winning by the fine margin of just three seconds in 26:39. Wallsend Harriers’ Danielle Hodgkinson took a mighty scalp when she beat Stockport’s international star Elle Baker when she ran 30:47 to Baker’s 31:33. Morpeth’s Jane Hodgson took the final podium place in 32:09, with Jarrow & Hebburn’s fast improving Georgia Campbell also impressing in 32:42. The 36 year old men’s record of 25:16 held by ‘K Foster’ and Jill Boltz’s (nee Hunter) course best of 25:35 from 1988 are safe for another year, though! History was very nearly made in the smallest town in the UK, Llanwrtyd Wells, after 22 gruelling miles over hills, through bogs and numerous river crossings, a man nearly beat all the horses for only the third time in its 38 year history. As it was, the first horse to cross the line passed a crucial medical test to verify it had been ridden with sufficient care over the hugely challenging course and was declared the winner by just 25 seconds over Victoria Park Harriers’ Joe Dale, who ran a fine 2:35:12. Dale’s club mate, Joss Polini finished just 85 seconds behind, with Ripley AC’s Matt Jackson in third in 2:48:18. The ever talented Jo Meek, consistently excellent over every distance and terrain she contests and now a GB ultra runner, took the women’s race in 3:04:05. Chepstow’s Karie Atkins and Victoria Park Harriers’ Annie Byrne took second and third in 3:09:38 and 3:10:20 respectively. The inaugural running of this rural Lincolnshire trail race was a resounding success, as scores flocked to the picturesque setting near Grantham to tackle the challenging rocky and grassy terrain. Leeds-based Abbey Runners made the long trip down to take part in the race as part of their annual club trip, and fittingly Ross Armstrong from the club took the top honours when he won in 38:24, a clear victory over Newark’s Lewis Hopkinsons’s 39:47 and Armstrong’s club mate Trevor Wilks’ 40:30. Nene Valley Harriers’ Ruth Jones enjoyed a close battle for much of the race with Abbey Runners’ Alex Kilcoyne, eventually posting times of 43:58 and 45:33 respectively, while Lisa Hobson posted a 48:26 result for third. Ultrarunning legend Steve Way ran one of his best ever performances when he clawed his way into the top three at the famous Comrades ‘marathon’ in South Africa, taking a very well earned third place in the Durban 56 mile ultra. It is the highest placed finish by a British man since Mick Orton in 1972. The notoriously mentally and physically gruelling race is the oldest ultra-marathon in the world takes runners between Durban and Pietermaritzburg, attracting 20,000 competitors every year. 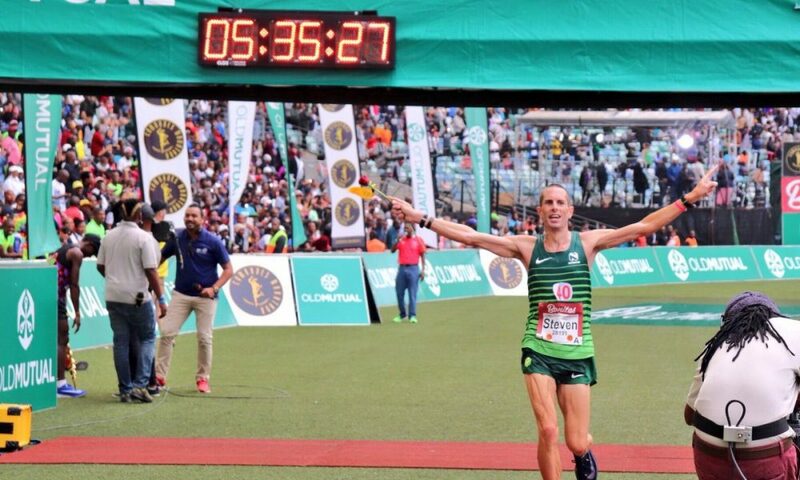 Way finished 9th in his previous outing last year in 5:49:38, but this year he bettered it significantly with a superb 5:35:27, albeit on the ‘down’ course between Pietermaritzburg and Durban (last year’s event being held on the ‘up’ route). Clapham Chasers’ Carla Molinaro ran a fine 6:50:31 to finish an impressive 9th woman, averaging 4:34/km over the extremely testing terrain. Her 2018 time represented an incredible improvement over her previous best on the ‘down’ course, having completed the event in 7:23:06 two years ago. Great Britain’s 10k specialist Gemma Steel took an easy win here in 34:09 in what was essentially a time trial for the bubbly Charnwood AC athlete. Her victory gave her more than a two minute margin over her nearest rival, Glasgow University’s Annabel Simpson, who herself ran a solo 36:23 ahead of Calderglen’s Julie Beveridge’s 40:37. Stilton Striders’ Natalie Teece was a class apart in the women’s race when she finished first female and fourth overall in 88:56, more than 13 minutes clear of second place. The course took competitors along undulating and often challenging hills in the Leicestershire countryside, so Jess Daws’ 1:42:31 and third placed Nicola Wade’s 1:43:52 still represented strong runs on a hot June day. Teece’s club mate Jason Barton was first across the line overall in 79:21, more than five minutes ahead of Dave Stevens’ 84:40, who also enjoyed a comfortable near-three window over his nearest rival, Grantham RC’s V50 Tony Johnson, who ran 87:32 for third. 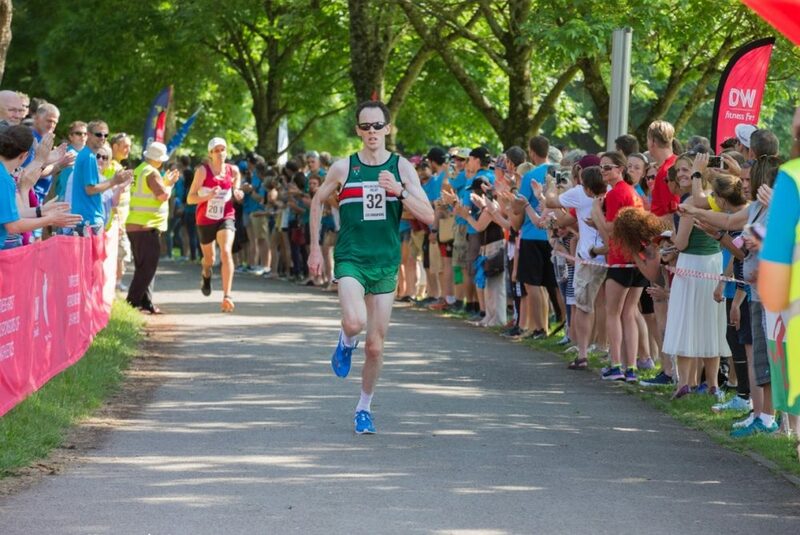 Cardiff AC’s Matt Clowes had already bounced back from his London marathon disappointment with convincing wins in the three road races he’d contested before he toed the line at the Potters Arf event, and he cemented his status as one of the UK’s quickest when he took the win in a new course record of 66:53. He didn’t have it easy early on in the race, though, when he had Blackburn’s Ben Fish, who features on Fast Running as part of the Fast 10: class of 2018, to contend with. However, Fish fell away to finish in 69:18, with Newcastle AC’s Felix McGrath taking third in 71:34. Wilmslow’s V40 Diane Mcvey was a clear winner of the women’s race in 84:12, well ahead of Derby’s Rachel Naylor (90:48) and Newcastle AC’s Michelle Buckle (91:08). The winner of the women’s race was Katie Clark, a name perhaps not familiar to many runners nowadays but the Hull athlete has a classy 33:36 10,000m PB from her American collegiate days and her victory here in her home city in 37:20 hopefully signals a return to competition for the talented 27 year-old, who last competed in 2014. Stockport’s Jenny Knass and Sophie Lee took the second and third places in 38:46 and 38:58. Sleaford’s Alan Oliver took the top spoils in the men’s race at this popular North Eastern event in 33:53, ahead of Scunthorpe’s Matt Smith’s 34:00 and East Hull’s Alec Gibson’s 34:12 in what was a fairly tightly fought contest for the prize positions. Sale Harriers and Les Croupiers RC took the honours at the Welsh Castles Relay over the weekend. The famous event takes place over 20 stages, starting in Caernarfon on Saturday morning and winding its way South, with a rest stop on Saturday evening in Newtown. The race then restarts early on Sunday morning, culminating 10 stages later in the shadow of Cardiff Castle late on Sunday afternoon. A record 67 teams took part in the 36th edition with overall male and female titles at stake along with master honours and a business house category to be decided. The race awards prizes for ‘King of the mountains’ stages as the race passes through both the Snowdonia and Brecon Beacons National Parks. A special ‘Jeff Wood’ award is made in the memory of the founder member and stalwart of Les Croupiers RC who collapsed and died at the event in 1998. Parc Bryn Bach’s Lee A’herne was the recipient this year as the first master 50 on the chosen stage. Manchester club Sale Harriers dominated in the men’s race, retaining their overall title with relative ease and a winning margin of 51 minutes. Host club Les Croupiers RC was second ahead of local rivals Pontypridd Roadents, a further six minutes back. The women’s race was a far closer contest but it was the 2017 champions, Les Croupiers that again came out on top. Serpentine last won the event in 2015 and were second this time. Sale Harriers had led at the end of the first day but settled for third as the race reached the Welsh Capital. “It means so much to win this for the third year in a row,” said Les Croupiers Team Captain Ainye Kenny commented. “The team did really well particularly in these really hot conditions.